The Trump Administration is considering withdrawing the United States from the international Paris Agreement on climate change. That would be a disaster—environmentally, economically and diplomatically. 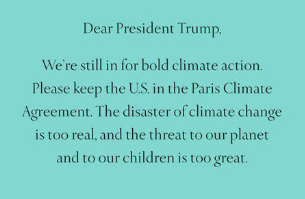 In outrage, an astounding number of businesses, citizens, US and world leaders have urged the White House to remain in the Paris Agreement—as we started documenting earlier. This overwhelming support for staying in Paris has caused Trump’s advisers to delay the decision on Paris until after the meeting of the G7 heads-of-state on May 26-27. To help the new Administration fully wrap its mind around the vast constituencies of support for the Paris Agreement, here is a running tally of the thousands of people and organizations that have spoken out. This list will be updated to reflect statements supporting the Paris Agreement as they become available. It’s already clear that these voices far, far outnumber the handful of political opponents—primarily polluter-backed think tanks—who want Trump to withdraw from Paris. 2. Twenty of the largest and most recognizable companies in America publicly cautioned against withdrawal from Paris, including Apple, BHP Billiton, BP, DuPont, General Mills, Google, Intel, Microsoft, National Grid, Novartis Corporation, PG&E, Rio Tinto, Schneider Electric, Shell, Unilever and Walmart. 5. Energy companies supporting the Paris Agreement include ExxonMobil , ConocoPhillips , BP, Shell, Total, Statoil , Cheniere Energy , Cloud Peak Energy , ​ Peabody Energy and Arch Coal . 7. 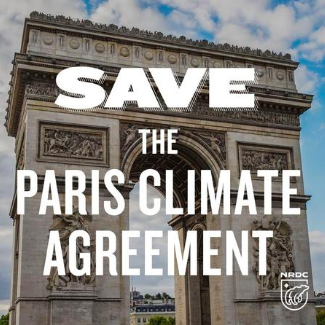 The international president of the International Brotherhood of Boilermakers, Iron Ship Builders, Blacksmiths, Forgers and Helpers, AFL-CIO, CLC—a union headquartered in Kansas representing workers in construction and maintenance, shipbuilding, cement making, railroads, manufacturing, mining and other industries, has written in support of the Paris Agreement. "The momentum to address climate change is real. It was demonstrated by the 2015 Paris climate change accord, signed onto by nearly 200 countries. It exists at the highest levels of world governments and in the boardrooms of major corporations. It would be wrong for the world’s leading economy, and one of the largest emitters of greenhouse gases, to abdicate leadership in the quest to find solutions." 3. Christine Todd Whitman, former head of the EPA under George W. Bush , urges Trump not to break the U.S. commitment to Paris:"I would point out to him that, if we break that, we are ceding any influence on other countries we might have to limit their pollution and that we are again sending a message that we do not care about this. This is an enormously important issue to us and to the world." 4. Former Secretary of State Condoleeza Rice also warned the new administration about the potential diplomatic backlash that could result from the U.S. fully withdrawing from the agreement. 5. Former U.S. Special Envoy for Climate Change Todd Stern wrote that "Hardheaded analysis based on the interests of national security and U.S. business leads to the inescapable conclusion that remaining in the agreement is in America’s best interest...It would be an act of careless disregard for national security to walk away...withdrawing from the Paris agreement would be a stain on the legacies of both the president and Secretary of State Rex Tillerson, an act of diplomatic malpractice...So don’t pull out—it’s a decision you’d live to regret"
2. Governors of states that accounted for one-third of the U.S. population and nearly 40 percent of US GDP have publicly urged Trump to stay in the Agreement. "Given the progress our states have made in reducing greenhouse gas emissions, we are convinced that the United States’ goal of 26-28 percent below 2005 levels is readily achievable. Maintaining the U.S. commitment is essential to protect our residents, and indeed, all Americans from the potentially catastrophic impacts of a changing climate...We stand ready as state leaders to continue to support the achievement of the existing U.S. Nationally Determined Contribution (NDC) to the Paris Agreement—and if possible to go further, faster...Collective action to limit emissions world-wide is critical; without collaboration, climate change will cost the world’s nations several trillion dollars in damages. Under the Paris Agreement, all the world’s major economies are taking action on climate change for the first time, including China and India, which have put forward their own commitments to cut their carbon pollution domestically." 3. Governor Charlie Baker of Massachusetts and Governor Phil Scott of Vermont sent a letter to Secretary Perry in support of the Paris Agreement: "We, the Republican Governors of states that have taken a leadership role in combating climate change, write today to request the United States maintain the commitment to the Paris Climate Agreement...We believe maintaining this commitment and the U.S. leadership on climate change is the right action for the protection of our children, grandchildren and future generations. It also allows us to maintain our global economic leadership." 4. Fourteen Attorneys General of the U.S. have urged Trump to remain in Paris. "...the undersigned state attorneys general urge you in the strongest terms to maintain and reconfirm the United States’ commitment to this groundbreaking agreement." 5. Seventy-five mayors across the country want Trump to uphold the U.S. commitment in the Paris Agreement: "Climate change is both the greatest single threat we face, and our greatest economic opportunity for our nation. That is why we affirm our cities’ commitments to taking every action possible to achieve the principles and goals of the Paris Climate Agreement, and to engage states, businesses and other sectors to join us...As the “Climate Mayors”, we wrote to you during your transition asking that you work with cities on climate action—the nation’s first responders and economic hubs—and to embrace the Paris Climate Agreement commitment." 6. 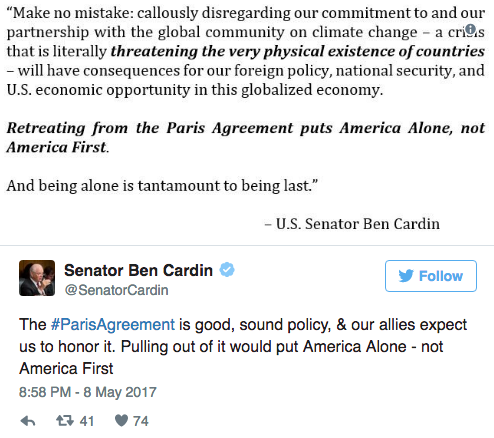 Republican Representative Kevin Cramer of North Dakota urged Trump to stay in the Paris Agreement. 7. Fred Upton , Republican representative from Michigan and chair of the subcommittee on energy within the Energy and Commerce Committee, does not support withdrawal from the Paris Agreement. 1. The new French President-elect Emmanuel Macron has emphasized to Trump that he will protect the global gains made in the Paris Agreement. 2. China's President Xi Jinping also pledged to protect the Paris Agreement on climate change during a phone call with French President-elect Emmanuel Macron. China's foreign ministry said that Xi would "protect the global governance achievements contained within the Paris Agreement on climate change." Early this year, Xi Jinping also spoke at the World Economic Forum in Davos about staying committed to the Paris Agreement: ​"We should honor promises and abide by rules. One should not select or bend rules as he sees fit. The Paris Agreement is a hard-won achievement which is in keeping with the underlying trend of global development. All signatories should stick to it instead of walking away from it as this is a responsibility we must assume for future generations." 4. The Prime Minister of Fiji issued an invite to Trump to visit Fiji and see the impacts of climate change firsthand, and urged him to reconsider his position on Paris.In a public appeal aimed at Trump he said: “Let’s see this process through for the benefit of all 7.5 billion people on Planet Earth, including your own citizens in vulnerable parts of America." 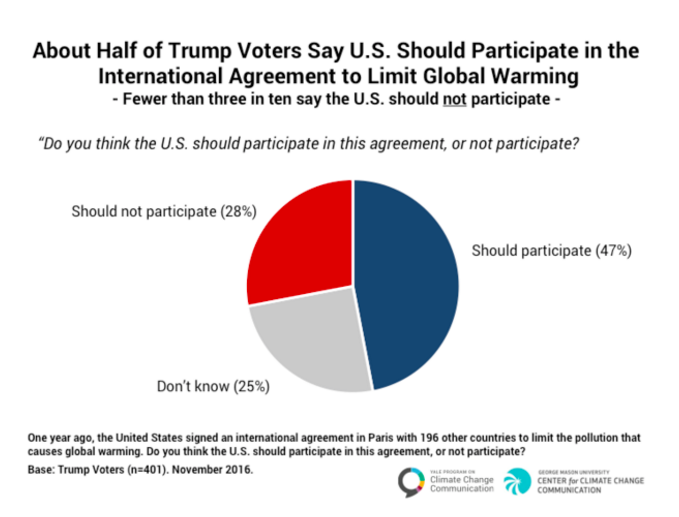 Seventy percent of the American public support the Paris Agreement. 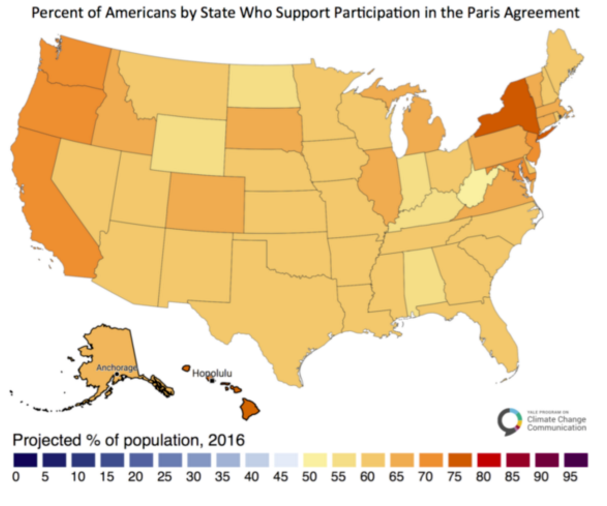 This includes majorities of Americans in every state , with far more Trump supporters in favor of staying in Paris rather than withdrawing. 1. A coalition of over twenty faith groups wrote a letter to Trump: "It is in keeping with our deeply held religious values that we write to urge that the United States remains a signatory to the United Nations Framework Convention on Climate Change Paris Agreement and fulfills our commitments under that agreement. As people of faith, we believe that we have a responsibility to be caretakers of Divine creation - to preserve our ecosystems for future generations and to ensure the human dignity and worth of all people. The ongoing climate crisis places a disproportionate burden on women and children, communities of color, low-income communities, and tribal nations both in the United States and globally....The Paris Agreement will safeguard God’s creation, protect the vulnerable, address the impacts of climate change and fulfill our moral obligation to future generations." 2. The Interfaith Center on Corporate Responsibility , a coalition of faith and values investors who actively engage companies on environmental, social and governance issues, is strongly urging President Trump to honor the U.S. commitments to the Paris Agreement: "We view continued participation in COP21 as not only critical to maintaining the competitiveness of our economy, but as a moral imperative and a statement of American values."